Workers at two German Amazon locations have walked out in support of higher wages and to press their right to collective bargaining. The all-day stoppage is set to disrupt services in Amazon's second biggest market. The latest skirmish in an escalating battle between ver.di, one of the largest unions in Germany, and Amazon, which employs 8,000 permanent workers at eight distribution centers in the country, one of the online retailer’s largest markets outside the United States. 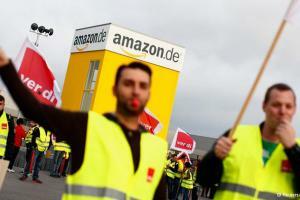 Deservedly or not, Amazon’s labor relations have lately come under intense scrutiny by German media.